A revolution in home woodcutting. Mountfield's MC48Li is an innovative 48V battery-powered chainsaw that forgoes the hassle of mixing fuels, refilling the tank, having to deal with fumes and all the starting problems of petrol models. It is powerful, lightweight and efficient, and can make many difficult garden jobs seem remarkably simple. 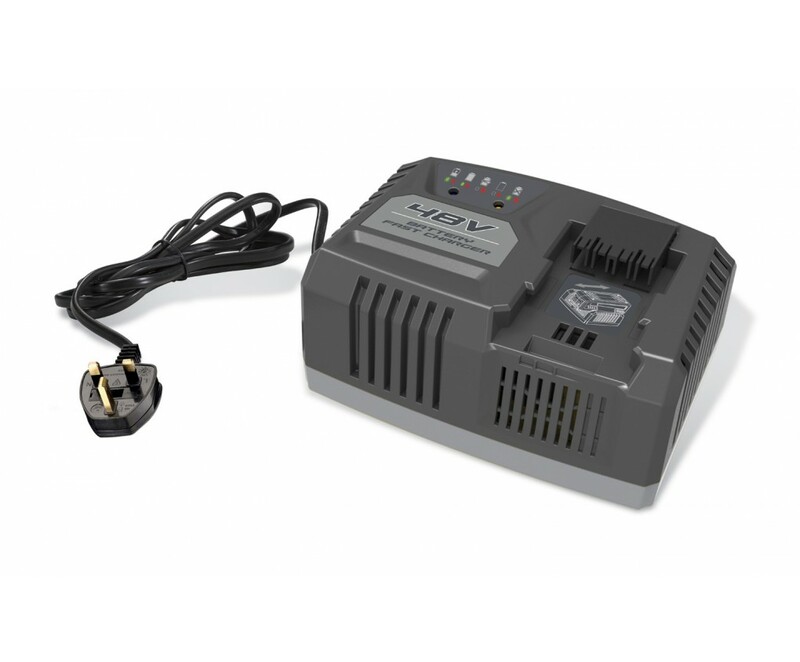 This machine runs on a class-leading 48V Lithium-Ion battery (sold separately), which powers a very efficient DigiTorq brushless motor. This intelligent power saving technology will save you energy and cost through repeated use. To use the saw, all you have to do is push the start button and hold the drive trigger. Using the 4 amp-hour battery (sold separately), you can expect up to 50 minutes of run time, which is roughly equivalent to 150 cuts through four inch logs. The Oregon chain and bar are easy to adjust, with the chain automatically lubricated from the translucent oil reservoir, making it easy to keep an eye on your level. Weighing just 4kg with the 4 amp-hour battery fitted (sold separately), this is a lightweight and easy to handle machine. Please note: Battery & charger sold separately. 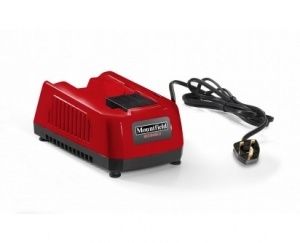 Mountfield's 48V fast battery charger is compatible with their 2Ah or 4Ah Lithium-ion batteries, designed from the ground up for their 48 Volt range. This is a 2.0Ah 48V Lithium-Ion battery for use with the Mountfield Freedom range of tools. A charge time of 90 minutes with the MCG48Li charger. This is a 48V 4 Ah Lithium-Ion battery for use with Mountfield's Freedom48 range. The MCG48Li battery charger offers fast recharge times for Mountfield's 2Ah and 4Ah batteries.